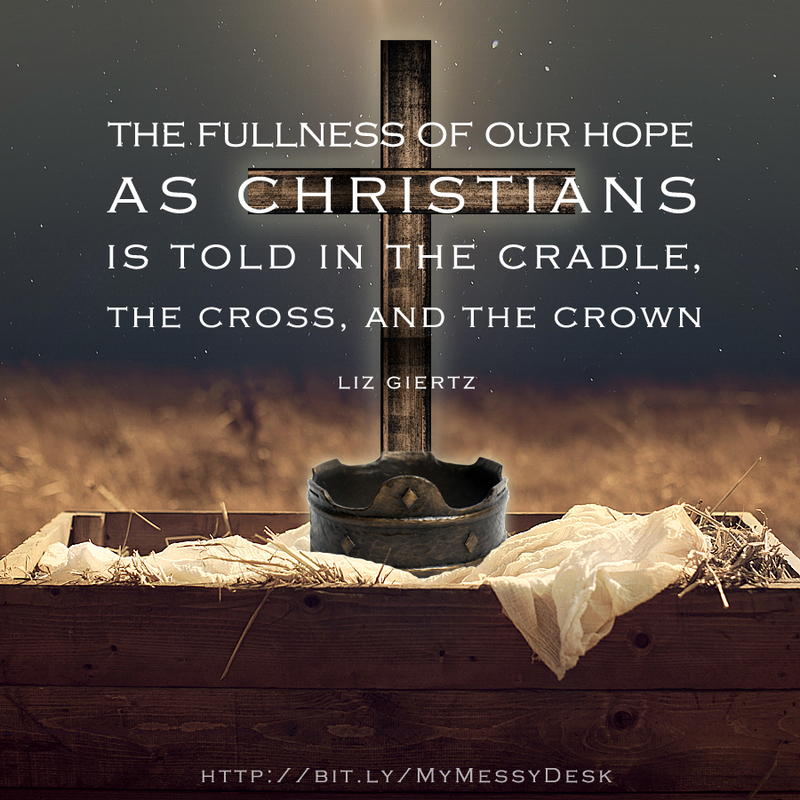 It completes the full story of the cradle, the cross, and the crown. In December I wrote about Hope for a friend’s two week Advent Bible Study. My prompt was “Expecting The Best is Yet to Come.” Even as I was writing, I simply couldn’t shake the feeling that our hope really comes at Easter. I wanted to skip ahead to the best part of the Christian faith. 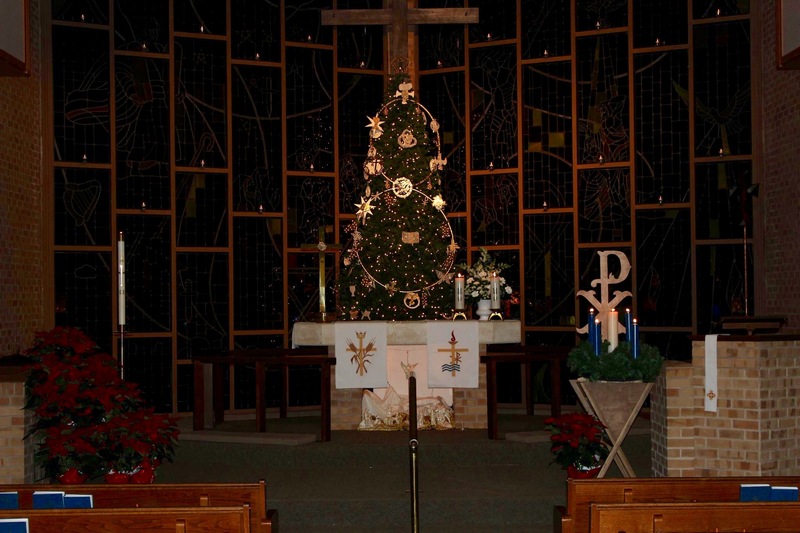 Then, a few days before Christmas, I sat in the pew looking up beyond the pulpit during a sermon. Hopefully, my Pastor isn’t reading because my mind wandered while he spoke as I processed the symbols I saw. In the foreground was the manger, Christ’s cradle. Towering behind the altar table, stood a tree adorned with Chrismons (ornaments that symbolize Christ) and topped with a sparkly gold crown. It was positioned so that it partially obscured the large wooden cross hanging in front of our stained glass windows. Let’s face it, Easter is the main event. The one that brings us hope. Hope in the risen Jesus that assures us of our own bodily resurrection when He returns in the fullness of His glory. He came to earth as a baby in a cradle – fully human, fully God (Hebrews 2:5-18). He came to us. No matter if you’ve been naughty or nice. He didn’t come because we deserve saving, but because we are incapable of saving ourselves. It doesn’t even matter if you believe it or not. He Came Anyway. Though He rightfully deserved that shiny crown, He took the twisted thorns and all the punishment associated with it to atone for our sins (Romans 3:25), so that God’s will could be done on earth. Bypassing the earthly crown, He endured shameful death on the cross. But then on the third day He rose again, demonstrating the promise of the resurrection for all who believe. That when our faith remains despite earthly trials, we, too, will receive the crown of life (James 1:13). No matter what we are going through, the fullness of our hope as Christians is found in the cradle, the cross, and the crown. Christ was born fully man and fully God resting in a rustic cradle to fulfill the prophecies of the Messiah’s coming. He endured the punishment for our sins on the cross, died, conquered death, and rose again so that we all might wear the the crown of life when He returns to establish His eternal kingdom. If any one part is left out, the story is incomplete. But together, they give us the hope and strength and courage to face whatever may come our way between the cradle and our own crown. Christ came in a cradle, and endured the cross to spare us the shame, so we could wear the crown of righteousness in His Kingdom. Dear Father, thank you for sending Your son to earth in a humble cradle to endure the shame of the cross for my sin, and for reminding me of the promise of my resurrection every Easter. Draw my focus to the crown when earthy trials and temptations threaten to pull me away. Help me to always cling to the hope I have in You. In Jesus’ Name. Amen. *Gorgeous graphic courtesy of the very talented Kate DiZio at http://www.katherinedizio.com/. Thank you for this lovely summary of all that Jesus has done for us. Amen, Michele! Thank you for stopping by today! Yes, yes, yes, Liz! I am with you on this! (I am also a great Christmas tinkling lights lover and did not take down the tree until early February!!) Easter is the main event and it is also crucial we don’t forget that we are a part of the ongoing story as His disciples. Happy to be visiting as your neighbor at the Linkup at The Beauty in His Grip today! Hmmm… So true, Pam! I love the idea of celebrating Easter year round. The gift of the resurrection shouldn’t be limited to just one day a year! Thanks for stopping by today! Beautiful! I love the completion of this! God always finishes every story He starts. Thank you for sharing your words and heart…stopping by as your neighbor at Women With Intention Wednesdays. Enjoyed how you have relayed the message of salvation through the three symbols: cradle, cross and crown . Thank-you!